After throwing away the J. League championship last season, few could have expected Urawa Reds to respond so emphatically. 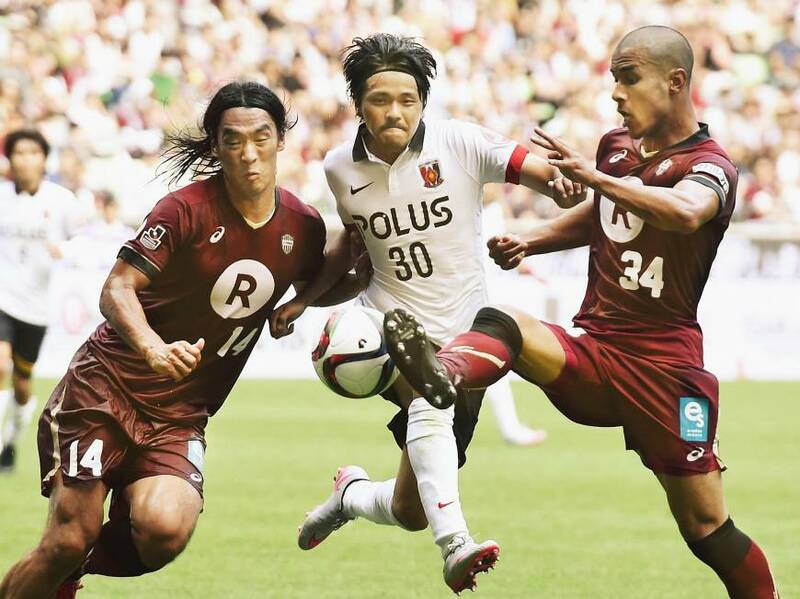 Urawa wrapped up the first-stage title with a week to spare on Saturday after a 1-1 draw with Vissel Kobe, claiming the silverware with an unbeaten record after 16 games, five points clear of its nearest challenger. 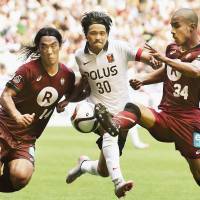 The Saitama side’s iron resolve has made it almost unrecognizable from the team that blew a five-point lead with three games remaining last season, and few would now bet against Reds making it through the entire first stage without a defeat when they host Albirex Niigata on Saturday. “Where we’ve grown is that now we’re able to dig in,” said captain Yuki Abe. There has indeed been a new maturity and pragmatism about Urawa this season, but a rejigged attack has arguably made just as much of a difference. Yuki Muto has proved a revelation since joining from Vegalta Sendai over the offseason, giving Reds the pace and incision to make their counterattacks count. Takahiro Sekine has responded to becoming a first-team regular with some excellent performances, while the arrival of Zlatan Ljubijankic from Omiya Ardija has given Reds a top-quality backup to Shinzo Koroki in attack. In short, Urawa looks a much more clinical, effective team this season, and far less prone to the kind of anxious, muddled play that plagued it for so long in the past. But can the league leaders translate first-stage success into a long-awaited championship come the end of the season? The revised two-stage format means a stage win does not carry quite as much importance as it did in its first incarnation from 1993-2004, and Reds were quick to turn their focus toward the overall points title that guarantees a place in the championship game. Make no mistake, Reds will have savored winning their first silverware since 2007. But unless it leads to the ultimate prize at the end of the season, it is unlikely to be remembered fondly. Is there any stopping Hisato Sato? Sanfrecce Hiroshima’s talisman striker took his J. League career scoring tally to 202 goals with a hat trick in Saturday’s 5-1 mauling of Montedio Yamagata, 152 of those coming in the first division. Sato only needs five more goals to match the 157 set by the top flight’s all-time scoring leader, Jubilo Iwata legend Masashi Nakayama, and having scored seven already this season, the 33-year-old looks a safe bet to break the record before the end of the year. “I wanted to achieve this at our home stadium, but I still don’t feel it’s enough,” Sato said of passing the 200-goals mark, helped by his sixth career J1 hat trick. The storm clouds are gathering over Shimizu S-Pulse. The Shizuoka side, which narrowly avoided relegation for the first time in its history last season, lost 2-0 at home to resurgent Venforet Kofu on Saturday, dropping to dead last in the table for the first time in 10 years. S-Pulse midfielder Genki Omae missed a late penalty to rub salt into the wound, and a repeat of last season’s great escape is looking far from assured. — Urawa Reds fans celebrate their first-stage title with a banner reminding the J. League that opposition to the new format is unlikely to go away soon.